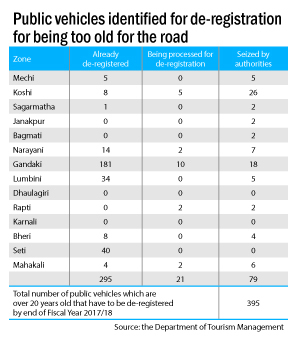 KATHMANDU, May 15: Although over 5,000 public vehicles older than 20 years are plying the roads across the country according to government estimates, only 395 have been taken under control or dismantled, a data compiled by the Department of Transport Management (DoTM) shows. The government decided to put a ban on public vehicles that are 20 years or older from March 15. Likewise, the government has received application for de-registration of 316 vehicles at different transportation management offices across the country. Out of them, 21 were in the process of getting de-registered as at April 13, the data shows. The number might look small, but it is not possible to dismantle all the estimated 5,500 old vehicles at a go, Aryal added. “Entrepreneurs, expecting that the government will back out from its commitment to discard old vehicles from Nepali roads, are avoiding the use of the vehicles or may have been using such vehicles in rural areas where traffic police are not present. So, only around 7 percent of 20 years or older vehicles are in the process of de-registration,” said Aryal. According to the data, 26 vehicles were taken in control in Koshi zone, followed by 18 and seven, respectively, in Gandaki and Narayani zones. Of the total applications received for de-registration, 65 percent are Gandaki zone. 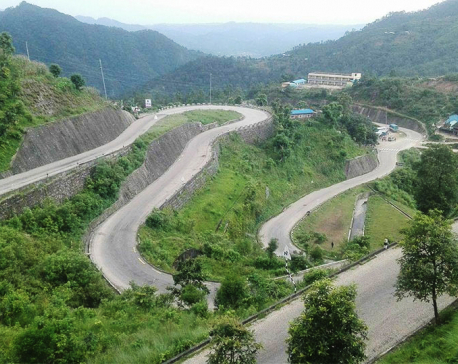 While the government is firm on its decision to scrap off old vehicles from Nepali roads, environmental experts and transportation entrepreneurs alike believe otherwise. “While outlawing vehicles that are over 20 years is a good step as old public vehicles is not equipped with the most recent and eco-friendly technology, and the ill maintained condition of most public vehicles worsens this fact, the cause of a large quantity of pollutant is a selected few vehicles,” said environmental activist, Bhushan Tuladhar. “However, as not all vehicles 20 years and above give off large quantity of pollution, and there are also comparatively newer vehicles which give emit more than older ones, the government should have adopted a more holistic approach in this issue,” he said, adding that the government’s approach seems more like generalization that all public vehicles plying the roads for 20 years or more give off high amount of pollutants. Tuladhar stressed on the use of electric vehicles for public transportation to uplift the quality of air in cities like Kathmandu. Lal Prasad Guragain, secretary of Digo Sahari Yatayat, seconded his claims. “The amount of pollution a vehicle causes depends on the vehicle manufacturers. While Indian vehicles cause greater pollution even after five years of use, Japanese vehicles cause lesser pollution even after running for four decades.